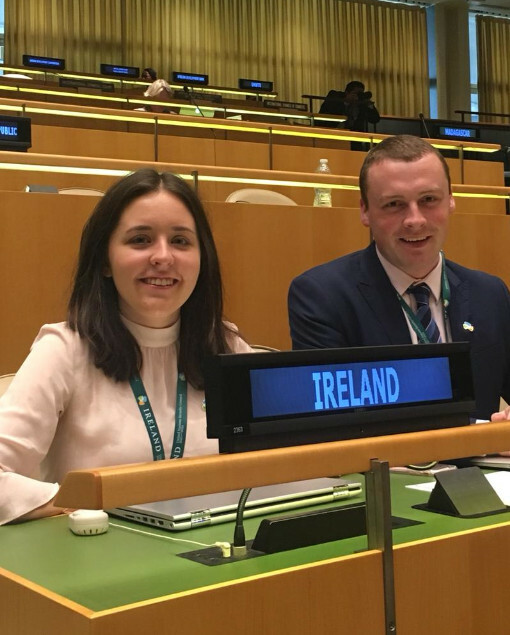 We're delighted and proud that two young people Aisling O’Boyle (22) from Dundrum, County Dublin and Jamie Moore (26) from Dungarvan in County Waterford addressed the 3rd Committee of the United Nations General Assembly in New York on October 3rd. Achieving full gender equality by 2030. The threat of climate change, particularly its impact on young people. Unacceptable numbers of young people not in education, employment or training. This amazing opportunity to represent the youth of Ireland during 'Third Committee' - one of the six main committees of the General Assembly, the UN committee dealing with human rights issues - is part of the UN Youth Delegate programme we run in partnership with Irish Aid and the Department of Foreign Affairs and Trade. The role also involves wide ranging consultation and engagement with young people by the delegates upon their return. Those holding youth events in Ireland can contact unyouth@nyci.ie to invite the Irish UN Youth Delegates to attend. Or book into one of our regional Meet your UN Delegate events in Athlone, Cork, Waterford or Dublin. The delegates will also address a Youth Summit as part of One World Week organised by the NYCI on November 21st 2018.